As sweet as cinnamon: GT BOM Blocks! on Among The Gum Trees. I thought I'd share my blocks from the GT BOM still. So you can still stitch them if you want too. 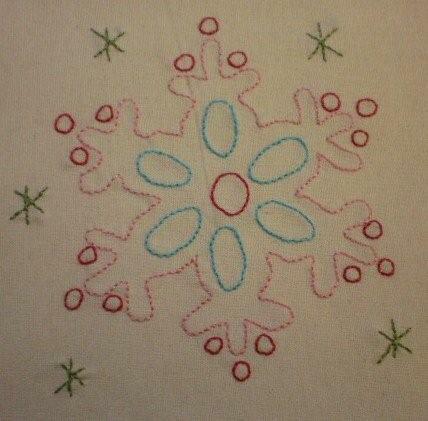 Here is Fee's version of my first block - Snowflakes! I hope you like them and enjoy stitching them. Visit the other GT girls for their blocks too. Aww Dawnie love the new stitchery!! Shoulda known you'd have a beautiful snowflake for us :o). I know what you mean its so easy to get involved with so many interesting groups on the web, then soon you notice that you have run out of hours in the day to do other things. I love reading your blog and this snowflake design is nice. Hello to you Dawn :) Lovely to see you on your blog again ... your designs are beautiful!! Good for you! Dawn dear, I'm so grateful that you were a member of Gum Trees, because that's how I got to know you. I'm afraid you're stuck with me now, lol...you are too precious to me. Thank you so much for the gorgeous designs hon, too funny that on the day you post a snowflake, I wake up to snow! Greetings from Venezuela! I just found your blog and let me tell you that I love it! Hi Dawn! Gosh, I had no idea. Big changes! I love popping in to your blog. You have it looking so pretty at the moment! It was a shame it ended with 'Among the Gum Trees' but I know there are not hours in the day for all the things we like to do. Thank you for the two pattern you shared with us. These are beautiful designs - can't wait to stitch them. Thanks for sharing!